The market for Smartbands and Fitness bracelets has become rich in models, from the cheapest to the most expensive, but with a common goal: keeping track of physical activity and notifying us of messages and calls. After reading our guide to the best smartwatches, you may have noticed that what you’re looking for is a product dedicated mainly to training and sports. 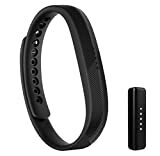 There are now many that can guarantee great satisfaction even at modest prices, so it has become necessary to create an article to help you choose which smartband to buy. Whether you are a regular sportswoman, or just curious to test it, you will certainly find the model that is right for you. With this guide we will try to shed light on the most interesting proposals of the panorama, dividing Smartbands by price range. If you also use some weight-loss app or weight-loss app, you will be able to take home important results if your goal is to lose weight. What is a smartband really for? There are several smartbands, also called fitness trackers, and some are more complete than others because they may have GPS, manage notifications, and so on. However, they have one thing in common: all smartbands or fitness bracelets are used to monitor daily physical activity or your workouts, including counting the active calories burned. And there’s more: you can also monitor the quality of sleep. Smartbands are also very precise as far as measurements are concerned, they often include pre-loaded workouts or an anti-sedentary mode that will warn you to get up and walk a little if you have been standing too long. Furthermore, there are also aesthetically pleasing smartbands. Because the batteries typically last four to seven days between recharges (apart from a few exceptions where the battery lasts up to 25 days), a smartband or fitness bracelet is certainly more suitable for a sportsman than a smartwatch because they offer also a complete management of your fitness level. These devices also allow you to set friendly competitions between your relatives and friends, for example: or share the results on social networks. If you are more curious about your daily movements, or if you want a quick way to keep track of a race, you can also save this expense and rely on your smartphone and the right application (there are many pedometer app). This means consuming extra battery for your smartphone and always having to carry your cell phone during your workouts (maybe even buying a sports armband). Finally, a fitness bracelet or a smartband is certainly more suitable also because it is equipped with sensors suitable for measuring heart rate, movement, counter of steps and so on. Those who want to approach the world of Smartband without spending a lot have a good choice available. They range from simple, non-display models to slightly more expensive models that offer more features. But now let’s talk about it and discover together which are the best fitness bracelets and the best smartbands to buy at the moment. Definitely the best in this price range. With Xiaomi Mi Band 3, the Chinese company has made a big leap forward in the world of Smartband. Compared to the previous series, it has added a 0.78″ OLED touch screen that provides us with basic information on our physical activity. The heart rate sensor has been improved, like the algorithm that regulates the counting of steps. There is also a touch button on the upper face. This allows us to scroll through the various information available. Another important aspect to emphasize is that Xiaomi Mi Band 3 is waterproof and underwater thanks to the IP67 certification. For those who love simplicity, surely Misfit Ray is an option to consider. Unlike many smartband that we offer, this one does not have a screen, and you will not be able to ” see ” the notifications. The high price is justified by the design and care of the materials. After the launch of the predecessor, Misfit Shine 2 has been improved to make it even more competitive. Increased autonomy, increased accuracy and added notifications from smartphones. As far as the distance traveled is concerned, the gap compared to the more famous fitness trackers is very minimal. A clip has also been added to hook it to completely redesigned clothes. Definitely glamorous design, perhaps a little too feminine, but certainly successful. Overall an excellent Smartband, not too expensive either. 12 multi-colored LED to check the time and progress. Remote controller for selfies, music reproduction and home automation devices. Waterproof up to 50 meters. Battery life from 3 to 6 months. Moov now one of the best motion detection technologies; the Omni Motion™ 9-axis sensor captures and analyzes your movements in 3D. 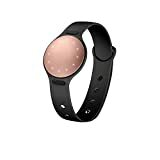 In addition to the accelerometer used in the usual fitness bracelets, it uses a gyroscope to sense rotation and a magnetic-field sensor for orientation. The Moov app contains 5 sports programs. Each exercise is a unique experience designed by experts. Moov teaches you new and effective methods to achieve your goals. The app contains 5 sports, 12 programs and more than 200 customization levels. You can access the data you are most interested in, such as the stroke recognition for swimming or the impact on the ground in the race. Moov tracks your activity 24 hours a day, even when you sleep, signaling how many hours you have slept. It is small, light, breathable, its battery lasts up to 6 months, and is available in 4 colors: Fusion Red, Blizzard White, Stealth Black and Aqua Blue. Moov Now is a wearable personal trainer and activity tracker for various sports that interacts with an app available for Android and iOS. Actively monitor your habits, offer advice on how to get the most out of your workout, track your progress and spur you on to achieve your fitness goals. The Moov Now programs identify your limits of endurance, power, intensity or cardio, and encourage you to improve. 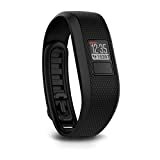 Compared to renowned products and well-known brands, this Huawei fitness bracelet does not cost much. The Huawei Band 2 Pro is also equipped with GPS as well as a heart rate sensor. Thanks to the display, it also allows you to manage notifications. Fitbit has proved to be a truly winning brand in the world of Smartbands and this product does not deny the fact. Similar to its predecessor as a design, it has a completely new core, starting with the heartbeat sensor. Present notifications and automatic monitoring of physical activity, divided according to the type of activity. Surely comfortable to wear and not very invasive, it turns out to be a really fashionable Smartband. Check the heart rate automatically and continuously directly on the display to detect calories burned. Record your training and record daily activity such as heart rate, steps, distance, climbing plans and active minutes. With instant access to data, wherever you go, you always have the motivation to be more active with you. If your phone is nearby, you can read the ID or number of the person calling you on the display. Battery type: lithium polymer. Radio transceiver: Bluetooth 4. Quality guaranteed by Garmin for this Smartband. Surely it turns out to be one of the most complete products thanks to the presence of GPS and heart rate reader. Always precise the measurement, viewable at a glance on the 2″ OLED display, easily readable in all light conditions. The notification system of the percentage of physical activity carried out, and time spent at rest is very comfortable on a visual level. Convenient on the wrist has nothing to envy to other competing models. Record steps, distance, calories burned and active minutes. Removable and ultra-thin tracker, which you can insert into straps, pendants and bracelets. 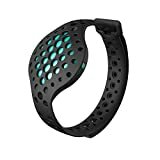 Tracker to record swimming, which you can wear at the beach, in the shower, at the pool and wherever you prefer; for instructions on maintenance and use. SmartTrack automatically recognizes certain exercises (running, cycling, elliptical, sports and aerobic activity) and registers them in your Fitbit app. Automatically records duration and quality of sleep and sets a silent alarm to wake you up with a slight vibration. A slim fitness bracelet that you can wear while swimming and in any situation. Hide the ultra-thin removable tracker in straps, bracelets and pendants, to wear it so others can’t see it. Automatic recording of all day and sleep activity shows you how all day data is added and SmartTrack automatic training recognition records your training for you. The progress display LED reserved to illuminate in different colors to indicate the presence of call alerts, SMS and Reminder for the movement. Also, you won’t have to worry if the tracker gets wet, either while swimming in the pool or while you’re running in the rain. Garmin is a brand well known by sportsmen, and for some years, it has successfully entered the Smartband and fitness tracker market. Garmin Vivofit 3 is one of the cheapest and spartan models. It has no heart rate sensor and does not display notifications. From the point of view of physical activity it is actually very precise and reliable. It offers a wide range of features, including the automatic detection of the type of physical activity performed. Slightly more expensive than the competition, it appears to be very precise and reliable. Here you go up a level. The products in this range are designed for people who do sports even at a professional level. The accuracy is greater and the Smartbands more accurate. In this price range, buyers are looking for excellence. There are no compromises, the features are at the top and the measurement precision is absolute. In addition to being the latest Fitbit in the house, it is also perhaps the best smartband in its class (although it is much closer to the design of a smartwatch). 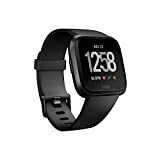 Fitbit versa offers a 4-day autonomy and continuous monitoring of the heartbeat, music without telephone, guided exercises but not making it perfect is the lack of GPS. Fitbit Blaze automatically and wirelessly syncs to over iOS, Android and Windows devices via Bluetooth 4.0 wireless technology. Bracelet with touchscreen and GPS: monitors the heartbeat 24/7, steps, distance, distance, calories burned, stairs up. Automatic sleep detection and vibration alarm. Caller ID, SMS and music control on the display. Water resistant, rechargeable. Surge is Fitbit’s Superwatch for fitness: a device for continuous heart rate monitoring, daily activity monitoring and GPS tracking. Suitable for athletes who want to get the most out of their performance, or for everyday activities, it has advanced features for interacting with the phone. The bracelet includes 8 sensors including 3-axis accelerometer, gyroscope, digital compass, GPS sensor, cardio sensor, altimeter, ambient light sensor, vibration motor. The backlit LCD screen with a customizable interface features a black-and-white touchscreen, from which you can interact with your smartphone: message control, incoming call ID and music control. The cardio sensor with PurePulse technology constantly monitors the heart rate from the wrist, 24 hours a day, up to 7 continuous days without having to recharge. Surge is designed with a high-efficiency battery so you can monitor a week of work or a marathon on a single charge. The design is designed so that it can also be used throughout the day, not only during sports activities, and is available in different colors such as Black, Blue and Mandarin. Surge automatically synchronizes wirelessly with Android tablets and computers, smartphones and iPhones, using Bluetooth 4.0 wireless technology. Fitbit Alta HR is one of the latest models presented by the Californian company. Colorful, comfortable and definitely fashion, it represents a truly inviting product for the public. The display is OLED touch type and allows displaying both information on physical activity and notifications such as calls, SMS and calendar. No heartbeat monitoring while sleep monitoring is present. Enjoy the power of continuous heartbeat detection technology integrated into Fitbit’s thinnest and most elegant tracker, ideal for the whole day, training and every occasion. By monitoring your heart rate, you can measure calories burned and control cardio zones (fat burn, cardio and peak) to check the intensity of the exercises that are ideal for your goals. Find out how intensifying your training can improve your health by comparing the trends of your resting heart rate with your activity. It improves the quality of sleep by automatically recording the time spent in each phase of sleep, light, deep and REM thanks to monitoring of the heart rate with PurePulse technology. Automatically record steps, distance, calories burned and active minutes. Continuous monitoring of the heartbeat based on purepulse technology allows you to get the most out of the exercises, to better track the calories burned and to get an overview of the level of aerobic activity; while full-day activity recording and automatic sleep monitoring help you understand how the entire daily routine is calculated. Possibility to record the exercises with multi-sport modes to display real-time statistics on the screen or to let the smart-track feature automatically record certain types of training for you. The large OLED display keeps you up-to-date thanks to notifications such as call, text and calendar notices, as well as reminding you to always be active with reminders for movement. The smartband helps you find the right time to relax with personalized guided breathing sessions. Furthermore, thanks to customizable clock screens and interchangeable straps, you can find the look that best suits your style. Fitbit charge 2 helps you find the motivation needed to improve yourself, step by step, every beat, every day. Compatible with Mac OS X 10.6 or higher, iPhone 4S or higher, Android 4.3 or higher and Windows 10. Monitor your heart rate continuously and automatically directly from the wrist. Get the most out of your exercises by using simplified cardio zones. Record the activity of the whole day, such as steps taken, distance traveled, calories burned, plans gone up and minutes active. With instant access to data, wherever you go, you always have the motivation to be more active with you. Compatible with Mac OS X 10.6, iPhone 4S or higher, Android 4.3 and Windows 10. Samsung Gear Fit 2 is one of the most beautiful aesthetically and certainly the most striking Smartbands. Equipped with an Amoled screen, GPS and wifi, it is one of the most complete products on the market. Do not forget the presence of the beat sensor and the bluetooth, which also allows you to connect the earphones, in addition to managing the connection to the smartphone. Good autonomy for the type of product; two days are always insured. It is also possible to immerse the Samsung Gear Fit 2 Pro up to 50 meters deep.